A teacher of Spanish designs a fun, interactive program to help learners of all ages achieve verbal fluency. Spanish learners deserve the best and most practical guide that will help them learn this increasingly popular and important global language. Today is the best time to learn Spanish, which is recognized as one of the five fastest-growing languages today by the language publication Fair Languages. One’s proficiency in Spanish will prove beneficial in the business world and open him or her opportunities for international travel. 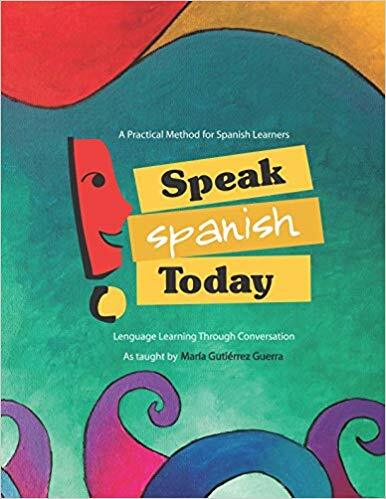 Anyone who seeks to learn Spanish should best pick up a copy of “Speak Spanish Today: Language Learning Through Conversation” (Bowker; 2016) by Maria Gutierrez Guerra. This language study guide aims to provide Spanish learners a fun yet practical resource that will allow them to speak Spanish fluently and with ease and as more as possible. “(It is) a program designed to provide you with an active learning experience, which gives you the chance to apply concepts learned in theory,” said the author. “Speak Spanish Today” introduces the essential language to deal with everyday situation and covers necessary structures to achieve verbal fluency. The program is divided into three sections, plus an appendix, and covers necessary structures to achieve verbal fluency. The author takes learners through Spanish alphabet and pronunciation; verb forms and conjugations; present, past and future tense; idiomatic expressions, and Spanish cognates – language essentials for everyday use. The author hopes that learners will benefit from the complete study of the structure and grammar of Spanish that her guide offers and that they enjoy the rewards of their work by freely speaking with others in Spanish. Watch out for the publish display of this interactive Spanish language study guide at the upcoming 2018 Miami Book Fair on November 11-18 at the Miami Dade College’s Wolfson Campus in Downtown Miami. Maria Gutierrez Guerra is a writer and educator. She is the author and editor of “Speak Spanish Today.” Her love for world languages started at an early age, she studied Linguistics at University Mayor de San Andrés, Alliance Française and Goethe Institute in La Paz, Bolivia. Maria’s own language learning experience gives her a better understanding of how students learn a second language and the obstacles that takes place. This was the inspiration to develop and implement a Spanish language acquisition method for children and adults. She has taught Spanish in different schools and one-on-one tutoring throughout the United States.